Sohan Lal, a traffic constable with Delhi police, is often short of breath, suffers bouts of wheezing and coughing, and sometimes complains of chest pain. He’s only 33 and was recruited after the health and fitness tests policemen have to undergo. 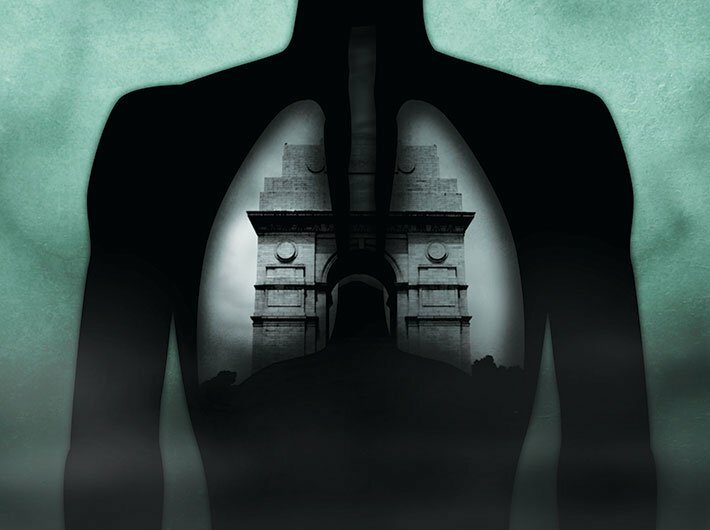 What has got him – and 25 percent of Delhi’s traffic police, according to a study by BLK Super Speciality Hospital – is years of point duty, inhaling the capital’s contaminated air on streets where hundreds of vehicles every minute emit noxious fumes. Traffic police, autorickshaw drivers, streetside vendors, couriers, the homeless, and anyone who is on the streets for hours are of course at particular risk. But no one living in the capital is spared. Perhaps it’s an unwelcome proof of phenomenal growth in recent decades that Delhi is synonymous with air pollution. In fact, air quality is so poor that Dr Randeep Guleria, head of pulmonary medicine at AIIMS, Delhi, has an alarming cigarette-index: just breathing in Delhi on a good-air day is equivalent to smoking three cigarettes; and on a bad-air day, it’s equivalent to smoking 25 cigarettes. Vehicular emission, though the major culprit, is not alone to blame. 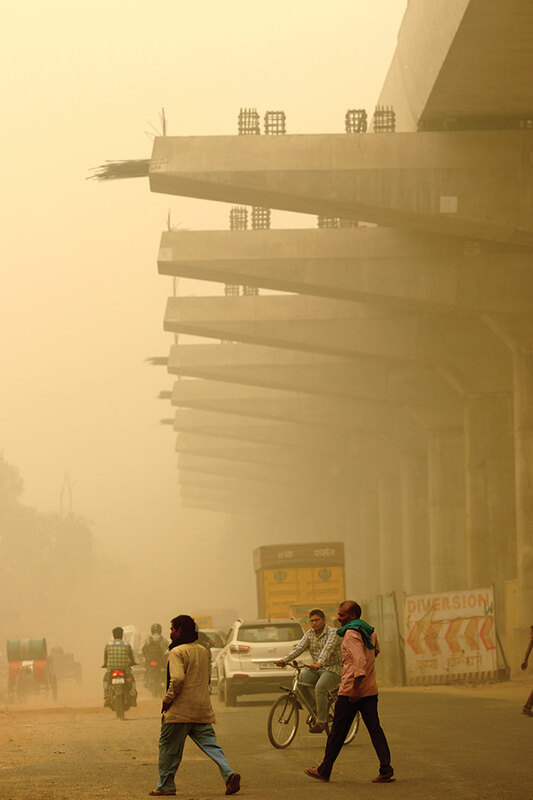 Dust from construction sites, industrial pollution, smoke from generators, coal-fuelled power stations, garbage burning, seasonal stubble-burning on farmlands in neighbouring states – all contribute to greying the air of Delhi and blackening the lungs of its residents. “The chronic effects are such they can lead to lung cancer, heart diseases, brain stroke and neuropsychological issues,” says Dr Guleria. Worse, much like minutes or days of life cut by smoking, estimates are being made of deaths caused by air pollution. An IIT-Bombay study says that air pollution caused 48,651 deaths in Delhi in 2015, more than doubling from about 20,000 in 1995. Such deaths are a worldwide occurrence. The WHO estimated that outdoor air pollution in cities and rural areas caused 3 million premature deaths in 2012. Of these, 72 percent died of ischaemic heart disease or stroke, 14 percent of chronic obstructive pulmonary disease or lower respiratory tract infection, and 14 percent of lung cancer. Death is literally in the air. Delhi is, in many senses, a sad repeat story. In the 1990s, Delhi had had a major air-pollution crisis. But a clean-up was achieved by ordering public transport to switch to environment-friendly CNG fuel in 2001. Visitors from other cities like Ahmedabad or Kanpur, equally notorious for pollution caused by vehicular and industrial emission, would remark on how much easier Delhi’s air was on the lungs. But all that gain has come undone in the following years, when Delhi grew as a business capital, with Gurgaon, Noida, Ghaziabad and Faridabad attaching themselves firmly to it as vibrant satellite towns. With public transport in a shambles, people took to using cars and bikes or scooters raising emission levels to dangerous levels. Over the last one year alone, the number of vehicles in Delhi rose 20 percent. The metro helped initially, but peak-hour commutes on it can be a can-of-sardines experience. Right now, there seems no long-term solution in sight. Last November, pollution levels were the worst in 17 years: PM2.5 levels were some 700 micrograms per cubic metre, more than 11 times the prescribed 60 micrograms per cubic metre. Winters are a major menace, bringing in smog and compounding the problem. It’s routine now for schools to remain closed for a few days every winter when air quality is at its worst. PM10 and PM2.5 – terms for particulate matter of size less than 10 and 2.5 microns respectively – have passed into common parlance: people recognise them as dangerous indices even if they do not know the concentrations that should cause concern. Particulates smaller than 2.5 microns are especially dangerous because the respiratory system has no mechanism to keep them out. They reach the alveoli, at the very end of the respiratory tract, and unexpelled, get absorbed into the body and the blood. From the blood, they reach all parts of the body, including the brain tissues. The Centre for Science and Environment (CSE), a voluntary group, reckons 3,000 additional premature deaths for every 10 micrograms increase in PM levels. In the last few weeks, PM2.5 in Delhi has been 300-400 micrograms per cubic metre – six times worse than the standard. There are things more toxic in the air. Benzene, as a carcinogen, tops the list, besides carbon monoxide, sulphur dioxide, and oxides of nitrogen. Much of the benzene in the air comes from burning fuel, and it is so toxic that long-term exposure, even when its concentration in the air is low, can cause leukemia. In the latter half of January, benzene levels in Delhi were well above the 5 micrograms per cubic metre standard: in areas like IGI Airport and Anand Vihar on a random day, they hovered between 10 and 13 micrograms per cubic metre. Scientists say benzene concentration rises on colder days, and before Delhi is past this year’s winter, there will be at least a few days when it will peak dangerously. Particulate matter (PM) is a mixture of solid particles and liquid droplets in the air – dust, soot, pollen and gaseous combinations thereof. The alphanumeric PM10 refers to particulate matter of diametre 10 microns or less. A micron is a one-millionth of a metre, or one-thousandth of a millimetre. Think of a micron as roughly one hundred times thinner than an average sheet of paper, which is taken to be 0.1 mm. A strand of human hair is 50-70 microns. So PM10 particles are at least one-fifth the thickness of a human hair and PM2.5 particles are about a quarter of that. Particulate matter in cigarette smoke can be as small as 0.1 micron. Particulate matter less than 10 microns can travel deep into the lungs; and particulate matter that’s less than 2.5 microns cannot be expelled by the respiratory system – it directly enters the bloodstream. What is the source of PM? There are mainly two ways in which particulate matter enters the atmosphere. Dust from construction sites, smoke from firecrackers and burning of fuel or garbage, and vehicular emission – all contribute. Quite a lot of particulate matter is formed indirectly, as a result of the reaction of gaseous substances such as oxides of sulphur and nitrogen, emitted by industries and automobiles. How bad is the situation in Delhi? According to the central pollution control board (CPCB), PM2.5 for Delhi as calculated on January 20, 2017 at 4 pm (for the previous 24 hours) was 229 micrograms/cubic metre. Now, according to the World Health Organisation guidelines, the permissible limit for PM10 (24-hour mean) is 50 micrograms/cubic metre, while that of PM2.5 is 25 micrograms/cubic metre. So, the PM2.5 level calculated for Delhi on January 20 was nine times the permissible limit. However, the limits set by CPCB seem to be quite relaxed. For the same day – January 20 – it had termed the reading of 73 micrograms/cubic metre of PM2.5, calculated for another city, as satisfactory. How does one save oneself from the harmful effects of PM? Masks can provide limited help. The most popular ones are the N95 masks, claimed to trap up to 95 percent of particles. It’s not clear up to what size of particulate matter they can keep out. The so-called air-purifiers claim to clean up 99.9 percent of PM2.5 pollutants. Again, it’s not clear how effective they are. The well-off might fool themselves by buying expensive devices like so-called air-purifiers or running away to vacation in the hills for a few days. The fact is: no one is spared. Researchers everywhere agree on what common sense dictates: as far as exposure to air pollution is concerned, whether in Delhi, Karachi, Beijing or Doha, the exposure rate for the rich and the poor is indistinguishable. After all, it’s the air you breathe that’s killing you – slowly. Winter, such as the bitter ones Delhi has, compounds the pollution problem. Almost every year, Delhi’s bad-air days begin around Diwali (when firecrackers and the falling temperature work in combination). Into the winter, the city’s air becomes twice as polluted as in summer or the monsoon. Is it just that the pollutants only seems more visible? Or is it that pollution levels rise? 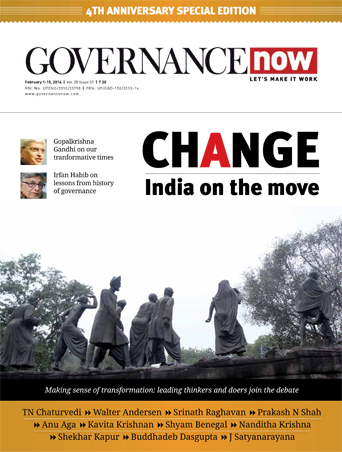 The AAP government in Delhi, habitually in a sulk about being wronged, whether by the BJP government at the centre or the lieutenant-governor, seems to be able to do little. So has any other government. Indeed, there are structural problems: there’s a governance overlap between the state, the centre, and the municipal corporations of Delhi and its satellite towns; also, Noida and Ghaziabad are governed by Uttar Pradesh; Gurgaon and Faridabad by Haryana. There’s a crying need for concerted action, especially on providing well-planned, easy, and reliable public transport that keeps pace with growth. But Delhi’s environment minister Imran Hussain seemed unwilling to acknowledge the chief cause of the problem or its complexity. “The biggest source of air pollution is not from Delhi, but from neighbouring states in the form of crop-stubble burning. Traffic in the NCR, especially in Noida and Gurgaon are contributory factors. Unauthorised construction by the municipal corporations clearly flouts environmental rules,” he says. Deputy CM Manish Sisodia had called a high-level meeting and ordered the use of sprinklers and mist fountains to ‘wash’ or ‘scrub’ ambient air, smoke-traps at crematoriums, and a waste-management system to cut methane emission at landfills. “A lot of plans are in place, and the environment department is conducting meetings to bring down the pollution levels,” says Hussain. Perhaps the best pointer to the chief problem might be the days when the odd-even plan was put into effect: only odd (or even) numbered vehicles on alternate days. There was marked improvement in air quality, less congestion on the roads and people breathed easier. In fact, in its latest plan, the Delhi government has decided that whenever pollution levels rise beyond a certain level, the odd-even system will be enforced. While that does not seem like a long-term plan for as big a city as Delhi, it’s a pointer to what is the major contributor of air pollution: vehicles. If we were to go only by the number of vehicles registered in Delhi (and the number on the roads are much higher than that), there’s a wake-up call: according to the Delhi government’s transport department, in 2012, Delhi had 24 lakh registered vehicles; in 2016, it grew to nearly 64.65 lakh. Another pointer, to connect this ‘addiction’ to the state of public transport in Delhi: according to Delhi Transport Corporation spokesman RS Manhas, Delhi (NCR population 460 lakh, and NCT population over 90 lakh) has only 5,000 buses and needs at least 10,000 more. Air pollution puts Asif Khan, an autorickshaw driver, in a difficult place indeed. He contributes to the pollution by the very act of driving a vehicle; and he suffers its consequences the most as someone who has to be on the road for his livelihood. His autorickshaw burns cleaner CNG rather than petrol or diesel, but vehicular pollution in a big city is a game of big numbers. One emitter off the streets makes too small a difference to count as significant. For that matter, even a few hundred off don’t make a big difference. Around 5.30 am, Asif Khan sets off in his autorickshaw for the Badarpur metro station, to pick up his first passengers. Often, they are metro-users seeking that vital last-mile connectivity. At every metro station, it’s the same story: hundreds of cars parked by commuters who use them to get to the station or back home on the return trip; rickety mini buses and midsize share-a-ride vehicles hailing and packing short-trippers; autorickshaws scurrying around like beetles to beat the competition. If Delhi’s planners had taken this factor into account, their plans seem to have been overwhelmed. It’s a mad rush during morning and evening rush hours, and Asif Khan tries to earn as much as he can. During the rest of the day, he goes anywhere in the city his passenger wants to go, exposed all day long to vehicular noise that leaves him stressed and inhaling noxious emissions that leave him coughing and teary-eyed by evening. Thanks to the symptoms, he’s acutely aware of the long-term risks he runs. When he gets home, he has to splash water on his eyes till the stinging subsides. “That’s my job, I can’t help it, it’s part of my life,” he says. “There are days, especially during winters, that I suffer from chronic cough. Doctors tell me to stay away from pollution or wear a mask when I drive. But if I wear a mask, female passengers avoid us. They see a covered face and are suspicious.” In fact, there’s very little that inexpensive cloth masks can do to reduce the risk. In any case, there’s no guarantee if even the expensive ones protect against particles smaller than 2.5 microns – about 1/30th the width of a human hair. 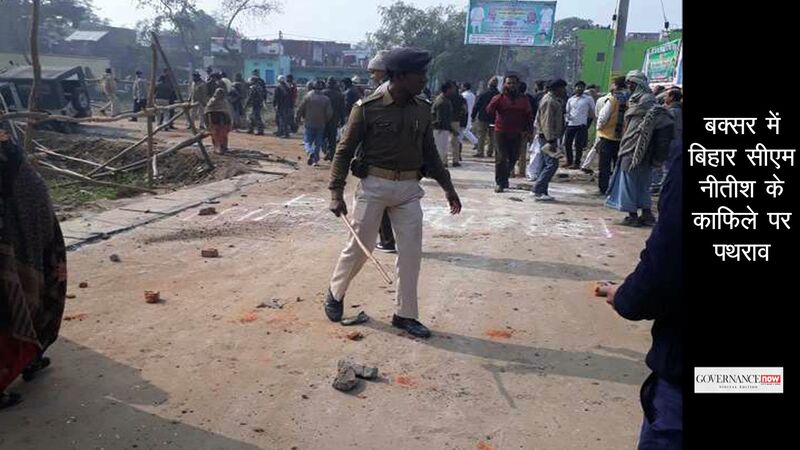 The saving grace for policemen like Sohan Lal is that the department is trying to help. Thousands of others, whose livelihood depends on being on Delhi’s streets, suffer the worst effects of air pollution without the safety net free treatment and other benefits that government servants enjoy. They are the worst-off exemplars of what every Delhiite is forced to endure. In fact, even the few hours every man, woman, and child is forced to spend outdoors considerably damage the respiratory system and general health. The wake-up calls are long past. There is no escape. Every breath is a killer.